On February 16th, Brooklyn/Jersey City-based alt-R&B duo sundrop released their debut album introducing sundrop. Everyone knows how important first impressions are when introducing yourself to someone, and sundrop certainly makes a great one. The multi-layered instrumentals and atmospheric vocals create an environment compliant to their branded 'comfy underwear music,' and their unique sound will make you remember their name. With each track, I felt my mind zone out and the tenseness in my muscles ease. introducing sundrop is the kind of album you put on after a long day to simply make you feel good, and we couldn't ask for more (except an interview with the two talented musicians who brought us the album). 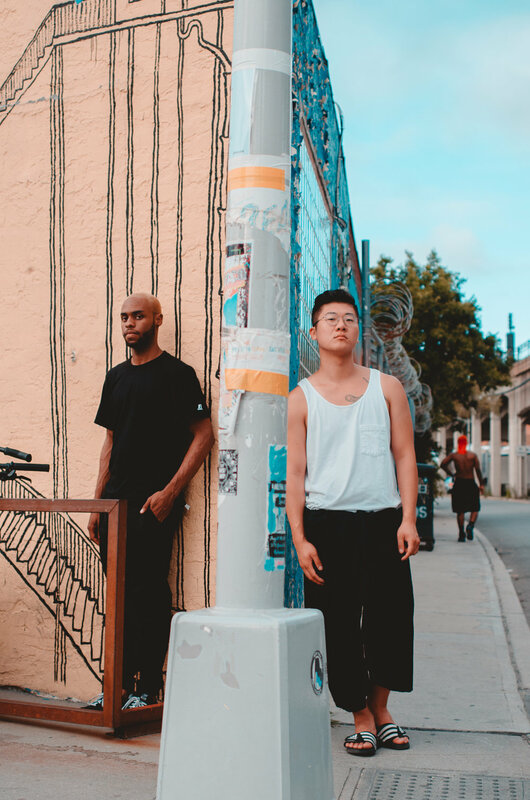 Read our interview with Mauki McGruder and Andrew Zhang of sundrop below! "The opening track of 'introducing sundrop,' 'Heather,' sets the scene for the album, and I think Heather describes the tone of it perfectly. This album is totally the kind of album you'd chill out on your couch in your underwear listening to. You really could listen to this album anywhere, but what other environments or settings could you see as the perfect scene to bump to these tracks?" ANDREW: "For me, a lot of the songs are introspective, so maybe in those moments when you’re alone with your thoughts such as when you’re sitting with your laptop getting work done in a cafe or riding the train to go pick up your belongings from your ex’s place." MAUKI: "Yeah, transitions. Whether it's from point A to point B in the car or on the train to school or work, leaving a lover, finding a lover, getting a new haircut, new job- any forward motion. I think there are a few party tracks too." "How does it feel to release your first album and what was it like recording it?" ANDREW: "It feels real good. I think it was an undertaking that we weren’t expecting, and we learned a lot about music and also ourselves in the process. As far as recording vocals go, I came to realize how important delivery is to singing on a record. Best advice I got from a friend was to sing happier on a particular song." MAUKI: "I feel a type of catharsis in sharing myself in this honest and vulnerable way with so many people. And having it be our first record, it feels like our first steps or first bike ride without training wheels in a way. The recording process was a lot of fun. Like, all these ideas had been rattling around in a brains for a while and we finally got to realize them and watch them come to life and breathe." "Keeping up with the theme of the album's title, how would you describe sundrop to someone being introduced to your music?" ANDREW: "Take three deep breaths and listen." MAUKI: "It's music for people who like music." "How did both of you meet and how long have you been making music together?" ANDREW: "We met on the road playing horns with Pitchblak Brass Band in 2016, started writing songs together in like the beginning of 2017." MAUKI: "We joined PitchBlak at the same time and had to share a bed. He snores in his sleep." "On the album, Mauki plays trumpet, Andrew plays trombone, and you both sing and play keyboard on it as well. Are there any other instruments you play that weren't featured on the album?" ANDREW: "I make a mean pot of chili." "What instruments don't you play that you'd love to learn?" MAUKI: "I'm working on bass right now." "Were either of you trained in music or are you self-taught?" MAUKI: "I studied classically as a kid and went on to finish college for jazz trumpet." ANDREW: "I have a degree in music ed." "Which do you prefer: writing lyrics or making instrumentals?" "And which do you write first: music or lyrics?" ANDREW: "It varies song to song." MAUKI: "Harmony comes first 80% of the time." "'Let It Fade' is a standout track for me. What inspired this particular song?" ANDREW: "The opening two lines came to me a couple of years ago when I got out of a long relationship. I think the act of writing this song was therapeutic in a way and allowed me to let out some stuff so I could move on." "I'm getting such a calming, sensual vibe from this album. It honestly seemed to instantly relax all of my muscles. What are some of the major themes or feelings you're hoping your listeners will capture when they tune in?" MAUKI: "I'm glad you got that vibe. I don't think I have any expectations for what the listener will feel." ANDREW: "For me these songs are about deep relationships, with people around us and ourselves." "Lastly, does sundrop have any upcoming shows or videos we can expect?" ANDREW: "We have some stuff in the works with our friends Bushwick Sounds, who did our first live video." MAUKI: "Playing at Rockwood Music Hall on March 1st. We'll be doing some traveling and come May, we'll be in Chicago shooting a video with Veltway Sessions."